Med-Eng®, a brand of The Safariland Group, has been awarded a five-year Indefinite Delivery Indefinite Quantity (IDIQ) contract to provide the United States Air Force (USAF) with the Med-Eng EOD® 10 bomb suit to protect personnel conducting Explosive Ordnance Disposal (EOD) operations. Under the contract, which has a maximum value of $15 million, the USAF may procure up to 305 EOD 10 bomb suits during the five-year term. “Med-Eng is honored to provide equipment that will help protect the lives of the United States Air Force’s EOD teams as they carry out critical, dangerous and life-saving missions,” said Rob Reynolds, vice president, general manager, Med-Eng. 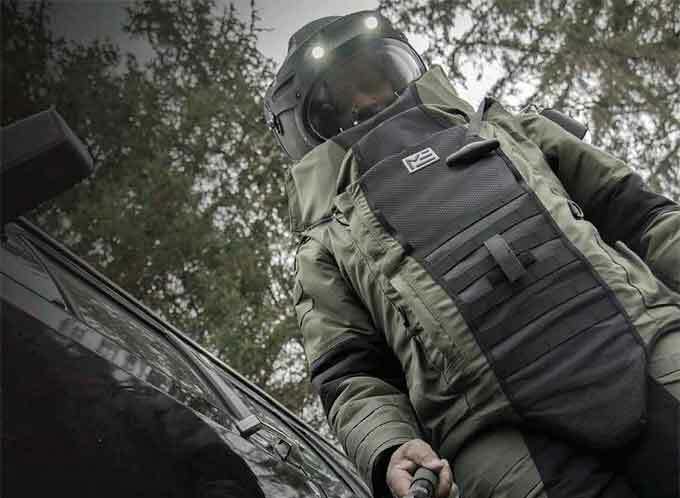 The EOD 10 bomb suit is certified to the NIJ Standard and meets or exceeds the USAF’s rigorous criteria. This NIJ Standard focuses on six crucial areas – fragmentation, impact, flame, some blast overpressure, optics, and ergonomics – that reconcile protection requirements with bomb technicians’ need for mobility, clear vision, and dexterity. Med-Eng is currently the only bomb suit manufacturer to meet the new NIJ Standard certification. This sophisticated bomb suit ensemble provides an optimal balance between multi-threat blast protection and ergonomic flexibility. Its user-focused design features voice activation, integrated cooling and compatibility with Chemical & Biological protective equipment. It has also been extensively tested against threats representative of Improvised Explosive Devices (IEDs). Fulfillment of the contract will support highly skilled manufacturing operations in Ogdensburg, New York, where Med-Eng produces bomb suits for all four branches of the U.S. Military, as well as for state and local law enforcement bomb squads. This facility currently manufactures the U.S. Army’s in-service Advanced Bomb Suit (ABS) and all other Med-Eng bomb suit models, which are widely used across the United States. The Med-Eng® brand provides integrated and battle-proven solutions for protecting frontline personnel from blast and heat threats. Its Personal Protective Equipment and specialized tools for Explosive Ordnance Disposal (EOD), bomb disposal, tactical operations and demining are trusted by military and public safety agencies in approximately 100 countries and territories worldwide. Its Crew Survivability solutions, including customized blast attenuation seats and thermal management systems, protect military vehicle crews and their mission-critical electronics. All Med-Eng equipment is engineered and rigorously tested to help save lives and enhance operational capabilities.